Mr Xplorer Upvote For Life Service. 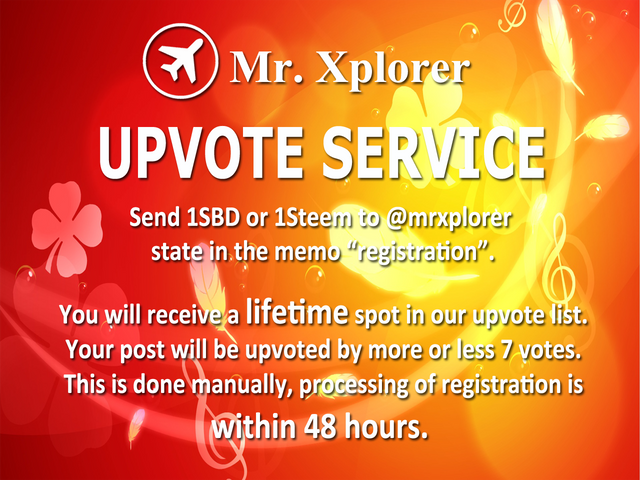 Any Steemians who will enroll in this service will be included in the upvote or curation list of @mrxplorer with a trail votes from 10 curators. The curation trail may increase as more Steemians are willing to follow our curation trail. Since the service is just starting the accumulated value of the curation upvotes may vary from $0.010 to $0.014. Steem Power of @mrxplorer is now 60SP. As more members arrive, our Steem Power will increase as well. We will allot 75% earnings of this service to power-up @mrxplorer account to help our community not only upvotes but also get higher vote value. As our curation rewards increase @mrxplorer will get stronger every day. How To Join Mr. Xplorer Upvote Service? To get daily upvote, follow curation trail of @mrxplorer. You will receive 1 upvote per day from mrxplorer curation trail.